Who is the most renowned nurse in Nebraska Methodist College’s first century of service? Without a doubt, that is Edna Fagan, a stern yet admired icon of nursing excellence known as "Miss Fagan" throughout more than six decades of association with NMC and Methodist Hospital. The daughter of a Methodist minister, Edna Alice Fagan was born in Springfield, Nebraska, in 1914. 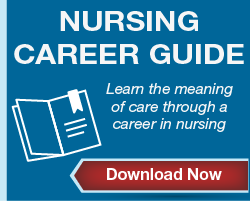 As a child attending her father's summer church camp, she met the role models who shaped her career choice: two camp nurses who were recent graduates of NMC, then the Methodist Hospital School of Nursing. When Miss Fagan enrolled there in 1935, her father paid the school fees of $50 for three years of instruction, books and uniforms. Miss Fagan and her classmates were immediately put to work at Methodist Hospital, then located at 36th and Cuming streets. Freshmen nursing students worked six and a half days a week. They brought meal trays, carried bedpans, fluffed pillows, and gave back rubs and bed baths. For long-term patients, the bath was followed by a rub with cocoa butter to keep the skin from breaking down. "They smelled like a Hershey bar when we were finished," said Miss Fagan. After graduating as a registered nurse in 1938, Miss Fagan considered herself fortunate to be hired by Methodist Hospital at a salary of $60 a month, plus laundry of her uniforms and meals while on duty. In 1943, Miss Fagan became the nursing school's single instructor. 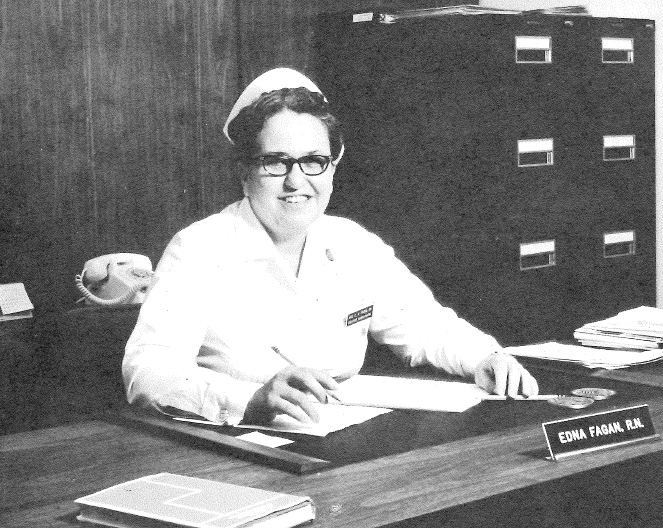 In 1946, Miss Fagan assumed a dual position as supervisor of nursing for both the hospital and its nursing school. Over the course of her career, Miss Fagan oversaw the education of more than 2,000 nurses. Miss Fagan shepherded the school through decades of intense cultural, medical and technological change. She was an early proponent and staunch advocate of diploma education who helped to lay the groundwork for the eventual shift to a baccalaureate program. After Miss Fagan retired in 1979, she continued to be an enthusiastic NMC supporter, and she donated initial funding for NMC’s first distinguished professorship, which was named in her honor. In 1981, the National League of Nursing awarded Miss Fagan the organization's highest honor, naming her Nurse of the Year. In 2001, Methodist's 110th anniversary year, NMC presented Miss Fagan with a Lifetime Achievement Award, honoring the nursing excellence that was "the life's work and great gift of Edna Fagan." Miss Fagan passed away in 2005 at age 90. One of the many ways her memory lives on at NMC is with the annual Edna A. Fagan Pledging Ceremony. This pinning ceremony symbolizes the passing of the torch from those more experienced in the discipline to the newcomers making their commitment to nursing. Sources: "A Century of Medical Miracles: Nebraska Methodist Hospital (1891-1991)" ©1991 by Hollis J. Limprecht and Nebraska Methodist Health System; Nebraska Methodist Hospital News, Volume 50, Number 2, June 1950; The Graduate, a publication of the Methodist Hospital School of Nursing Alumni Association, April 1980, "Forty Years of Dedication to Nursing: Edna Fagan"; The Graduate, a semi-annual publication of the Nebraska Methodist College Alumni Association, Spring 2001, "Fabulous Four"; The Graduate, Spring 2004, "Miss Edna Fagan Will Turn 90; “Nebraska Methodist College at 125: Scaling New Heights” ©2016 by Dennis A. Joslin, PhD, and Leo Adam Biga.